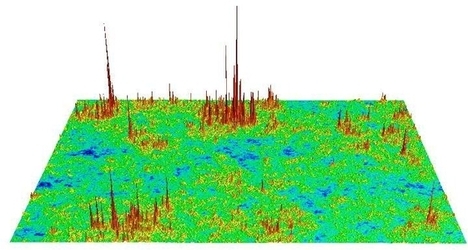 We investigate the properties of the electronic states both at the surface of 3D and at the edge of 2D topological insulators. Particular focus is on the quantum interference phenomena in the presence and interplay of both disorder and interaction effects. 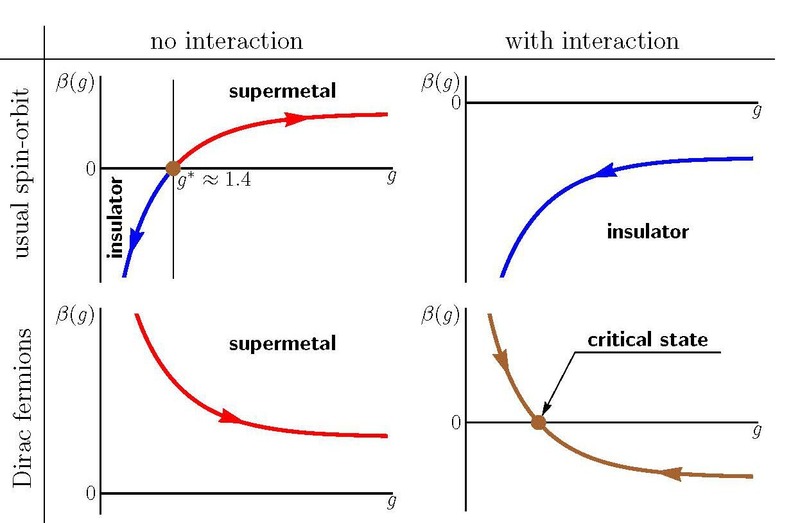 Possible superconducting properties of such topological materials, either intrinsic or induced via proximity effect, are also studied. We also consider topological excitations (Majorana bound states) in the junctions between topological insulators and superconductors, and their prospective application to the quantum information processing. We study various electronic properties of the mesoscopic superconducting systems. The main focus is on the low-dimensional structures including various chains of Josephson junctions and dirty interacting thin films. Strong quantum effects give rise to a number of unusual physical phenomena. As an example, the interplay of strong disorder and Coulomb interaction counterintuitively enhances the superconducting properties of two-dimensional films. 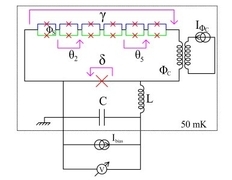 Measurement circuit with 6-SQUID chain inserted in a superconducting loop. The phase difference and magnetic fluxes through SQUIDS are independently controlled by two external coils. 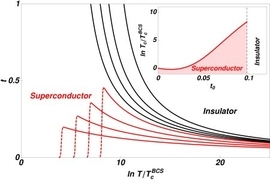 Temperature dependence of resistivity near the superconductor-insulator transition. Inset: phase diagram in the disorder strength - temperature plane. Electronic transport in 2D electron systems in transverse magnetic fields is explored. One research direction is related to non-equilibrium properties of quantum Hall systems subjected to microwave or strong dc fields. Resistivity of the microwave-irradiated 2D electron gas oscillates as a function of magnetic field. 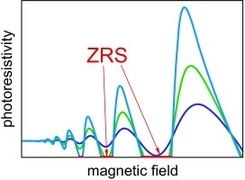 At strong fields, zero resistance states (ZRS) develop. We study Anderson localization phenomena in disordered electronic systems, in particular, of low dimensionality. The focus is on phase diagrams for various types of disorder, metal-insulator transitions and critical behaviour, and statistical properties of key observables. Multifractal electron wave function at the quantum Hall transition critical state.